Unmanned weapons are big news today, as it’s reported that a drone-fired missile in Yemen has killed Anwar al-Awlaki, the American-born jihadist who inspired the Ft. Hood killer, the Times Square bomber, the “underwear bomber” and more. If there has been a single terrorist as threatening to the US as bin Laden, Awlaki was it. Through his website, videos, and online English-language magazine, “Inspire” (Google will not give me the URL, but you can see some of its content here), he — apparently effectively — inspires home-grown terrorism, the most difficult kind to interdict. Inspire‘s editor, Samir Khan, was also reportedly killed in the strike. Everyone even slightly interested in military technology has known for some time that robotic weapons represent a major paradigm shift, like the phalanx, the longbow, the machine gun, the military aircraft, etc. War will never be the same. Pakistan has vehemently objected to the use of drones in its territory, claiming that innocent civilians are often killed by mistake. Of course, one might ask: would they prefer that we use bombers or artillery? The drones do a much more precise job of killing their targets with minimal collateral damage than almost any other way of doing it. And it isn’t immoral to want to reduce our own casualties. The Pakistanis simply don’t want us fighting there, period — a legitimate position for them to take, but the use of drones doesn’t strengthen their case, it weakens it. Engelhardt argues that the cheapness of the weapons, the ability to use them without endangering our soldiers, and even the relative freedom from collateral damage, makes us more prone to use them, to fight in more places around the world. The checks and balances that result from the expense and danger of conventional war, he believes, will not work to prevent excesses on behalf of the ‘imperium’. As [our leaders] definitionally twitch and turn, we can just begin to glimpse — like an old-fashioned photo developing in a tray of chemicals — the outlines of a new form of American imperial war emerging before our eyes. It involves guarding the empire on the cheap, as well as on the sly, via the CIA, which has, in recent years, developed into a full-scale, drone-heavy paramilitary outfit, via a growing secret army of special operations forces that has been incubating inside the military these last years, and of course via those missile- and bomb-armed robotic assassins of the sky. There is, however, another way of looking at it. Despite what Engelhardt thinks, we are not an invincible imperial power. In fact, the tide of history may have begun to turn in favor of those who hold the idea of democracy in contempt (yes, I know ours isn’t perfect), who believe in religiously-based hierarchical rule and the fundamental inferiority of women, who think that polytheists like Hindus must convert to their religion or die, that Christians and Jews must accept permanently inferior status, and that the US constitution should be replaced by the law of the Quran. One of the reasons that they have the ability to challenge us is that they have adopted and improved techniques of asymmetric warfare, particularly terrorism, which leverage against us the complicated economic and technological structures on which our survival depends. Terrorism is used as part of an integrated military, psychological, economic and diplomatic attack which has been quite successful in pushing Western influence out of the Middle East, and in damaging us socially and economically. 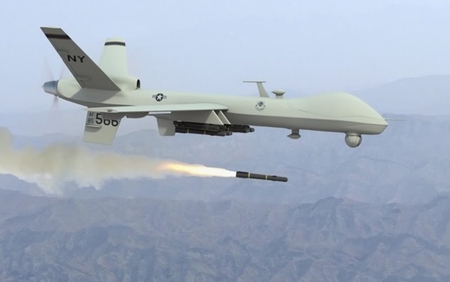 Weapons like the Predator neutralize to some extent the advantage of asymmetric warfare by enabling precise targeting of terrorists in the midst of civilian populations. You simply can’t do this any other way, regardless of cost. Traditional warfare is mostly fought by lowly soldiers, from the bottom up. But terrorist entities don’t fight with armies. We often don’t know who their ‘soldiers’ are. But they do have key men, and the way to fight them is to target the key men. Awlaki is a perfect example. Robotic weapons may be the answer to terrorism that we’ve sought for years. Engelhardt tries to suggest that the technology is actually driving its own use, that the Predators (etc.) in effect have minds of their own, and imagines scary science-fiction scenarios in which they actually do have minds of their own. But this is nonsense. They are controlled by human beings, targets are selected by human beings, and human beings must authorize their use. They possibly give rise to a higher degree of accountability than an assault rifle in the hands of an ordinary soldier, who has to make split-second decisions based on very imperfect knowledge. Although Englehardt would say that we have made our enemies what they are by our oppression and that they would leave us alone if we left them alone, I don’t buy it. There is an ideological imperative driving radical Islamic terrorism, and it is not one of live and let live. They have been empowered by the West’s money and technology and they are going to exploit it to their best advantage until they have conquered or destroyed us. I would probably agree with Englehardt and his friends that we could become a far more just and humane society. I would agree that we have sometimes fought wars for the wrong reasons in the wrong places. I would even agree that there is a moral rot in some of our most important institutions, including government, that we will need to expunge if we are to survive. But compared to our enemies, there is simply no comparison. We have an acrimonious debate in our country about whether gays and lesbians should be allowed to marry — in Iran, they hang them. We worry about the pervasiveness of poverty in ethnic communities — in Sudan and Mauritania slavery is legal, and in Saudi Arabia it is still prevalent after officially being abolished in 1962. Last week, there was a great outcry here against the execution of a possibly innocent man — in Syria, the regime is murdering hundreds of political opponents every week. We have two choices. We can defend our society against the asymmetric assault mounted against it by radical Islamists, while we do our best to improve it where it falls short of our ideals, or we can accept the verdict of the Islamists that it is hopelessly corrupt and evil, and not fight back. In my opinion the real motivation of those who attack the use of drones and similar weapons is that they are just too effective. I believe that on some level, people like Engelhardt want to see Western society humbled, even destroyed. History gives numerous examples of more advanced civilizations being destroyed by barbarians. In our case, I don’t think it’s inevitable. clearly it does not support the idea of Jewish sovereignty — rather, as we can see by examining the causes it supports, it views sovereignty as residing in the will of all of Israel’s citizens. This is a time-honored position, if not appropriate for a Zionist group. I think the official quoted was being honest and I don’t think there would be much disagreement among them, if NIF leadership would speak openly. I’m not attacking the NIF today, which I’ve done numerous times in the past. I just want to use this to illustrate a fundamental divide among Jews centering on Israel and Zionism. 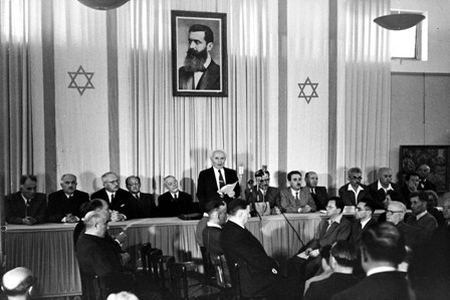 Zionism asserts that there is a Jewish people — a nation — and that it ought to have a ‘sovereign expression’, that is, its own country, in its historical homeland. Nationalism of any kind isn’t popular among those who identify as liberal or progressive. It’s a fundamental part of their official worldview that differences between national groups are inessential, ‘mere’ matters of culture, language, religion, ancestry, etc. As a result, they believe that it is immoral to base political structures on them. So much for any form of nationalism — including Zionism. That is not to say that they don’t take note of cultural differences. These are the people who like to ‘celebrate diversity’. And they advocate corrective political action when they believe a group has been discriminated against, like affirmative action. But they would justify this only in order to redress an existing imbalance. The logical extension of this is to post-colonialism, which asserts that existing worldwide political structures are massively unbalanced against ‘people of color’ (which doesn’t necessarily have anything to do with race), and that massive corrective political action, sometimes in the form of violent ‘resistance’ is justified. This leads to absurd positions, such as the toleration of nationalism and even vicious racism, misogyny, homophobia, etc. on the part of ‘oppressed’ peoples. These behaviors are considered a result of their oppression — post-colonialists blame the ‘oppressor’, never the ‘oppressed’ — and are presumably expected to go away when the oppression is eliminated. Nationalistic aspirations by non-favored groups, like the Jewish people, are rejected. In the event that they conflict with the aspirations of an ‘oppressed’ group — well, I don’t have to draw you the picture. This explains why the far Left is prepared to tolerate racism, terrorism and the rest when it is directed at Jews by Palestinian Arabs: a supposedly immoral nationalism is being challenged by an ‘oppressed’ group, with all of the special dispensations from normal moral rules that such groups are given. In an imaginary ‘ideal’ world — one that is impossible given the basic drives of territoriality, tribalism, greed, etc. that characterize the human animal — it would perhaps be possible to give up nations, borders, conscription, security barriers, and many other things that apparently so irk the NIF leadership. But in the real world, the assumption of these ‘ideal’ values — even if they were not accompanied by the pernicious, deliberate tolerance of evil that is post-colonialism — is a form of unilateral disarmament. Zionism, therefore, is not only an expression of the idea that Jewish culture is best preserved in a Jewish state and an effective response to antisemitism, it is also a response to the incoherent, fundamentally self-contradictory philosophy of post-colonialism. Happy new year — לשנה טובה תכתבו — to all. [EU Foreign Affairs chief Catherine] Ashton urged Israel to “reverse” its decision to build 1,100 new housing units in Gilo, saying that “settlement activity” threatens the viability of a two-state solution. Earlier, the United States said that Gilo plan was “counterproductive” and urged both Israel and the Palestinians not to take steps which could complicate resumption of direct peace talks. “We are deeply disappointed by this morning’s announcement by the government of Israel,” State Department spokeswoman Victoria Nuland said. So where is Gilo? Let’s see exactly how it is “provocative” and “redraws the borders”? Yes folks, this is what all the fuss is about: a few more apartments in an existing Jewish neighborhood where 40,000 Jews already live, located 100 yards from the Green Line, adjoining other Jewish neighborhoods and empty space. There are so many simply fraudulent issues here. One is the significance of the armistice line. It was not accepted by anyone — not the Jews and definitely not the Arabs — as a border in 1949, and UNSC resolutions 242 and 338 clearly implied that it was not to become one. Jews lived on both sides of it, in Judea, Samaria and eastern Jerusalem until the Jordanian army ethnically cleansed the area in 1948. The UNSC resolutions and the Oslo agreement clearly indicated that the border would be determined by negotiations between the parties. The idea that the land east of the line is ‘Palestinian’ has no basis in international law or treaty and has simply been repeated enough times by the Arabs and their supporters that many — apparently even those who should know better, like Ashton and Hague — have come to believe it or pretend to. Another false issue is expressed by the comment I heard recently that Israel is “gobbling up” the territories in order, as Abbas says, to “redraw the map.” But no new settlements have been established since Oslo (unless you count tiny unauthorized ‘outposts’ that are torn down by Israeli police, sometimes rather aggressively). The construction that is so vehemently opposed is all within the boundaries of existing settlements. 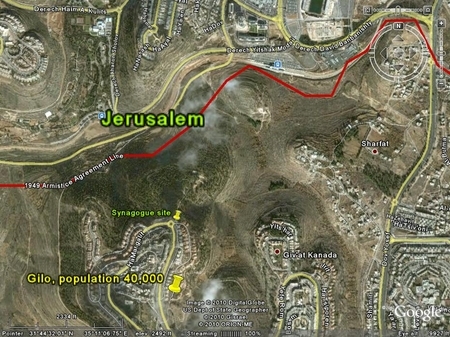 Finally, the requirement that Israel refrain from construction across the Green Line is a new one, adopted by the Palestinians in 2010, with the help of Barack Obama. Settlements did not prevent Israel from returning the Sinai to Egypt or (unfortunately) from evacuating Gaza. The Palestinian strategy is simple: promise serious negotiations if Israel will just [fill in the blank]. Then let the ‘international community’ pressure Israel. If Israel concedes, then there is suddenly another ‘roadblock to peace’. Israel is weakened, new starting points are set, and the process begins again. Of course there can never be truly serious negotiations, because the Palestinians will never agree to end the conflict while a Jewish state exists. Now that the Security Council vote is hanging over Israel’s head (as Caroline Glick explained recently), there is yet another club to beat Israel with. Unfortunately, there will be no agreement on these because they negate the heart of today’s Palestinian position and the Palestinian cause itself. Until there is a Palestinian leadership that can accept the idea that there will be a Jewish state, there’s no point in talking. Israel should make this clear to the US President, EU officials, and everyone else. It should not participate in a phony ‘peace process’ based on fraudulent issues like construction outside of the Green Line, which will only gnaw away at Israel’s security without bringing peace any closer. If this means taking unilateral steps like annexing parts of the territories and letting the chips in the UN fall where they may, so be it. If there can’t be an honest conversation, let there be no conversation at all. Update [1806 PDT]: Read more about Gilo and its history here. …all that is needed is for [Mahmoud] Abbas to say, in Arabic as well as English, that he accepts the right of Israel to exist as the nation state of the Jewish people, and that his own people will no longer wage war against it. If he were to say that, and to match those words by deeds to show he meant them – for example, by ending the incitement in the educational materials and media under his command to hatred and murder of Jews and Israelis – there would be peace and a state of Palestine. This will not happen, because Mahmoud Abbas does not speak the truth about Palestinian aspirations. Abbas Zaki does. …the dominant assumption in the west, the assumption that underpins virtually every political utterance on the subject and every interview on the BBC and the reporting even in notionally pro-Israel papers such as the Times or Telegraph that a state of Palestine would end the Middle East conflict, is not only wholly mistaken but is to mis-state that conflict. Arutz Sheva has obtained a document detailing findings from the scene of the crash. Among the evidence that at first failed, for unknown reasons, to convince police that terrorists may have been involved: a hole in the front windshield of the car, a massive rock found in the front seat with human blood on it, a tear in fabric of the steeling wheel cover and dust indicating a blow from the rock, and damage to Asher Palmer’s face suggesting an impact unrelated to the crash. 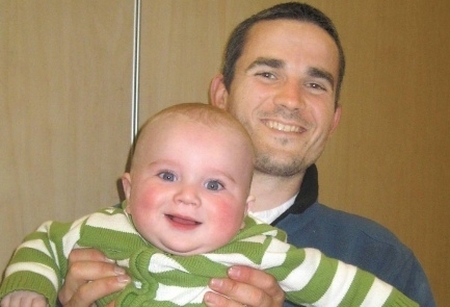 The autopsy and a CT scan of Asher Palmer’s face showed evidence of facial fractures caused by a rock. Every single day, hundreds of rocks, blocks, stones, etc. are thrown at Jewish vehicles in Judea, Samaria, Jerusalem and Arab towns or neighborhoods inside the Green Line. Sometime photographers are informed in advance that there will be exciting opportunities to view the heroic resistance to occupation. Throwing ‘stones’ (sometimes as big as a person’s head) is what Palestinian Arab adolescents do for entertainment. Even the great Columbia University ‘scholar’ Edward Said symbolically threw a stone across the Lebanese border at Israeli soldiers. Let’s give them a state! Update [9 Oct 0804 PDT]: The murderers have been arrested.